The very best pieces of iron are the heavy bolts that come from tanks. 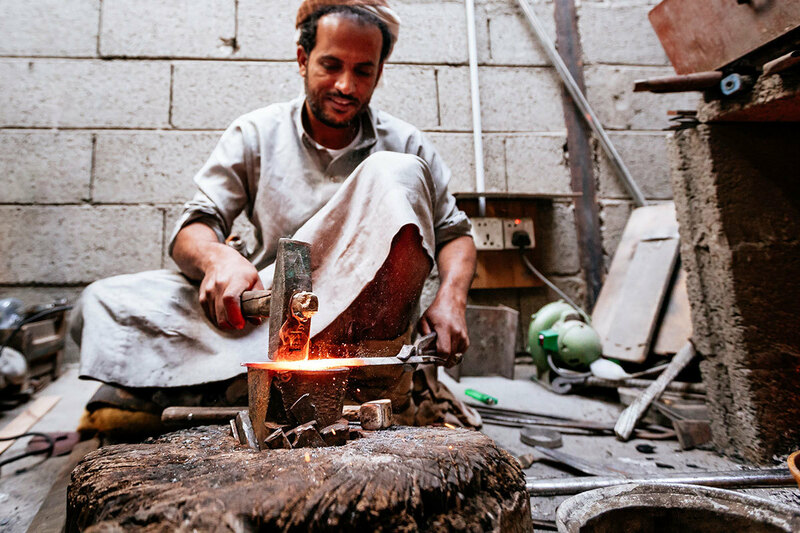 You can make two or three janbiya daggers from one of them, and they will never break,’ says craftsman Abdulrahman Ali Ahmed Saleh Qitayan from his workshop in the town of Najran in southern Saudi Arabia. Qitayan holds up an elongated piece of iron with a pair of metal pincers. The iron is hot, burning red, having just been removed from the fire. He’s seated on the floor, next to an open oven at the back of his small workshop. 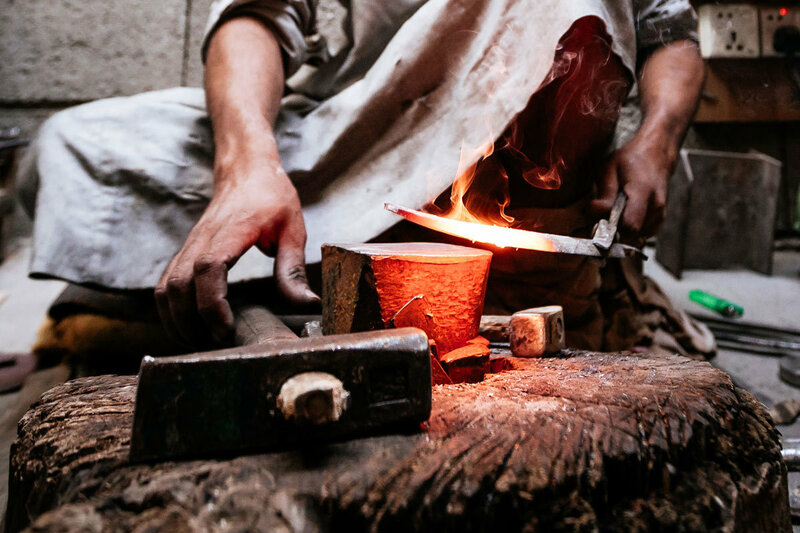 He holds the iron still and lifts a hammer – with repeated thuds he beats the iron into shape. ‘This is the hardest part of the process. It takes strength and endurance,’ Qitayan says. Slowly, the piece starts to take shape. The bulky iron is transformed, bit by bit, into a slim and sharp weapon – a janbiya, the traditional dagger worn by men across the Arabian Peninsula. 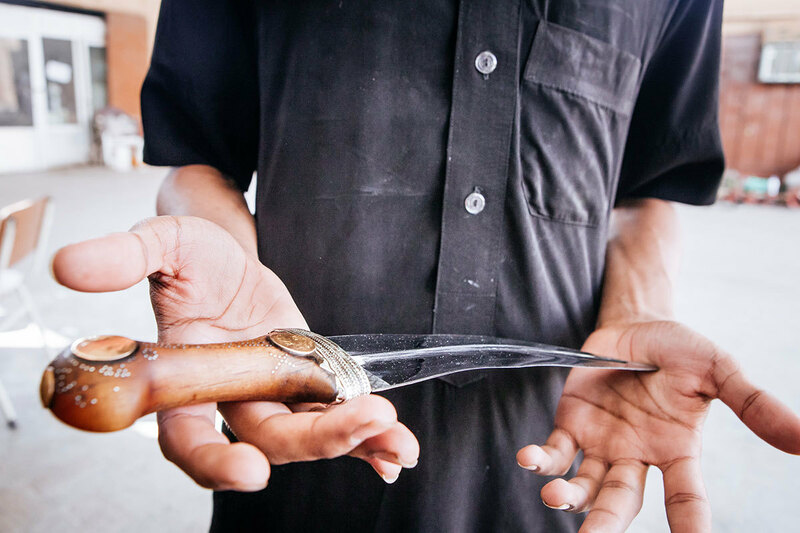 In Oman and the United Arab Emirates, the knife is known as khanjar; Saudis and Yemenis call it janbiya, from the Arabic word for side, ‘janb’ – though the dagger is worn at the front of the stomach. ‘I got this from my grandfather when I was a teenager. I’m the eldest son in the family,’ says a man outside Qitayan’s shop, with a beautifully embellished silver janbiya around his waist. His dagger is worth 41,000 Saudi riyals: the most prized possession in the family. In the past, parents would traditionally give daggers to their sons when they were seven or eight, as a symbol that they were about to leave childhood behind. ‘Now they wait, until 13 or 14 usually, because there’s an idea that once you have your janbiya you should be ready to fight,’ says Mohammad Al Munasteer, a visitor at Qitayan’s shop. Najran’s dagger market is one of the biggest in the region, along with one in Yemen’s capital Sanaa. 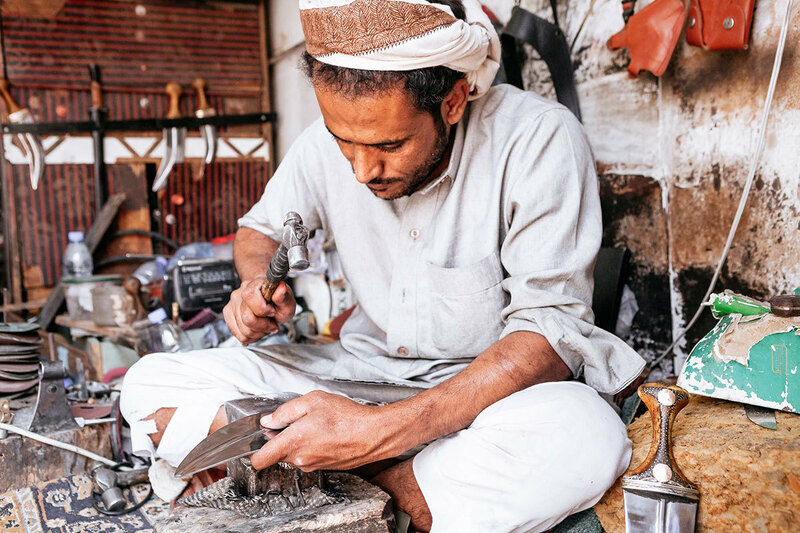 People drive hours to come and sharpen their daggers in Najran, or buy new ones after long and careful contemplations. There are dagger belts with gold and silver embroidery for sale, and both new and used sheaths and daggers. The cheapest are mass-manufactured copies; the most expensive – and difficult to find – are antique pieces, used and meticulously cared for. The most sought-after work still comes from Yemen’s old Jewish community, which mostly left the country between 1948 and 1950. 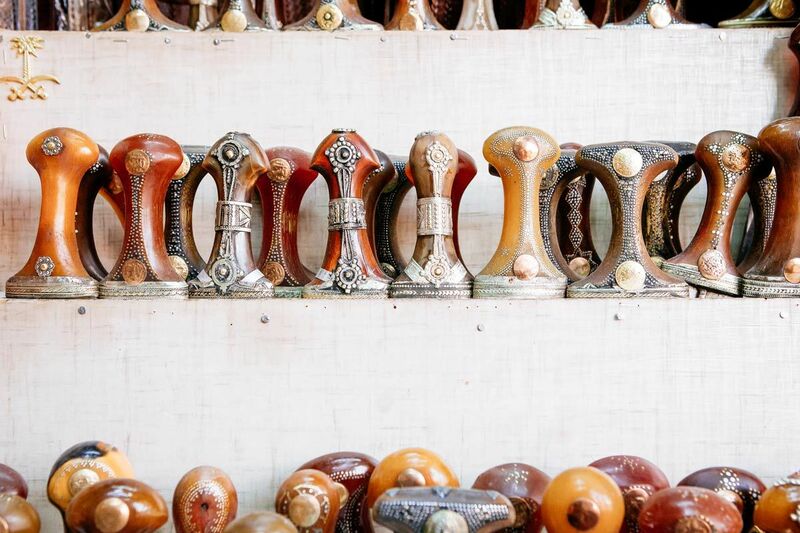 Several highly skilled Jewish artisan families originally produced the handmade daggers, and the craft still bears the Arabic name ‘amal yahoudi’. In one of the workshops across from Qitayan’s two brothers sit next to each other on the floor – Mohammad and Rahmat Ali. 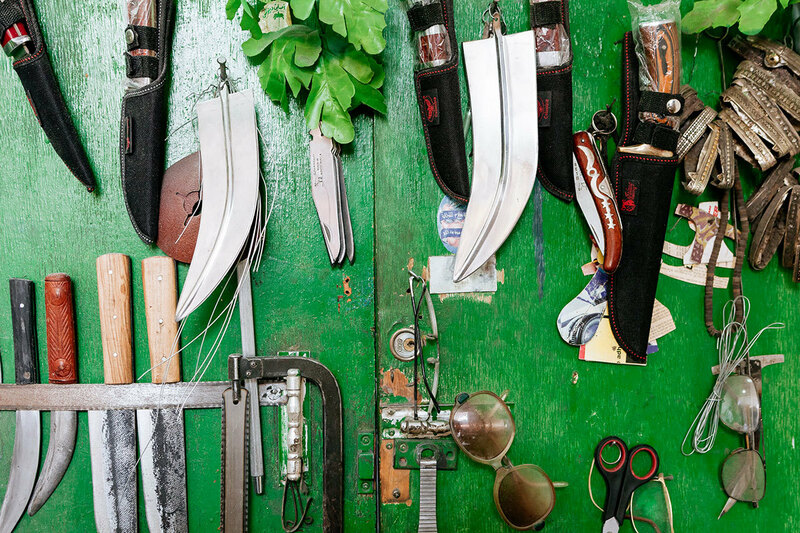 They came to Najran from Pakistan more than 20 years ago, and have been manufacturing daggers and knives ever since. 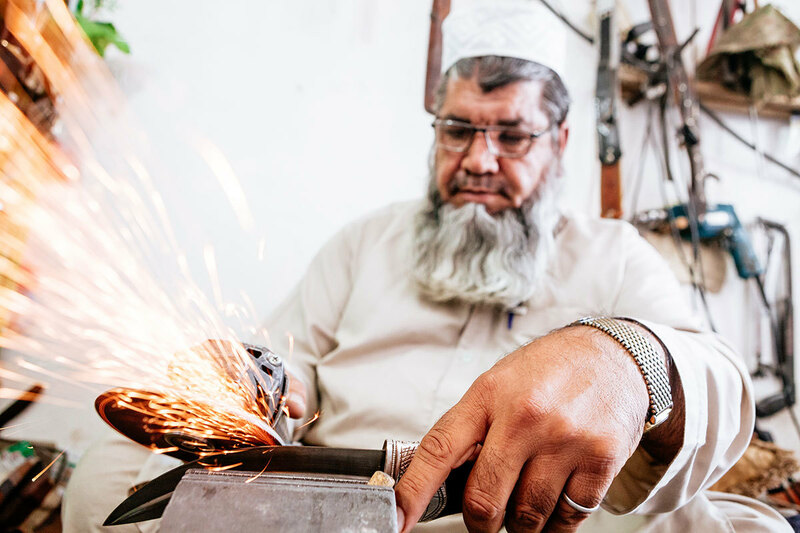 ‘We used to work with rifles in Pakistan, so we went from one kind of weapon to another,’ says Rahmat as he overlooks his brother perfecting an iron blade. The owner of the dagger, a man who drove several hours from the city of Khamis Mushait to reach Najran, sits on a chair with a small cup of tea, patiently waiting. Mohammad grinds the dagger carefully, until it fits comfortably in the sheath. ‘You learn to perfect the work,’ he says. Surprisingly, it’s not the knife that’s the most important part of the janbiya, but the handle. The quality of the blade may determine the weapon’s strength and durability, but the hilt is what carries the symbolic significance – revealing the social status of its owner. ‘The most valuable hilts are made from rhinoceros horn – because of their quality, and because they’re very rare these days,’ says Al Munasteer. The handle is the most valuable part of a janbiya, with the most costly pieces made from rhino horn. Nowadays ivory has been replaced by wattar, plastic mixed with natural fibres. Qitayan reaches out for a chunk of hard material in a bronze tone – it looks natural but is plastic, mixed with natural fibres. This is what he uses nowadays to make janbiya hilts: a cheaper, more available alternative to illegal rhino horn. ‘It’s called wattar and is popular because the finished handle looks like those made from rhino horns. We use other kinds of horn as well – buffalo or ox.’ Once carved out, polished and finished, the handle will fit perfectly in the hand. Hilts are then decorated with details in gold and silver – tiny nails, geometrical shapes and metal rings or beads. 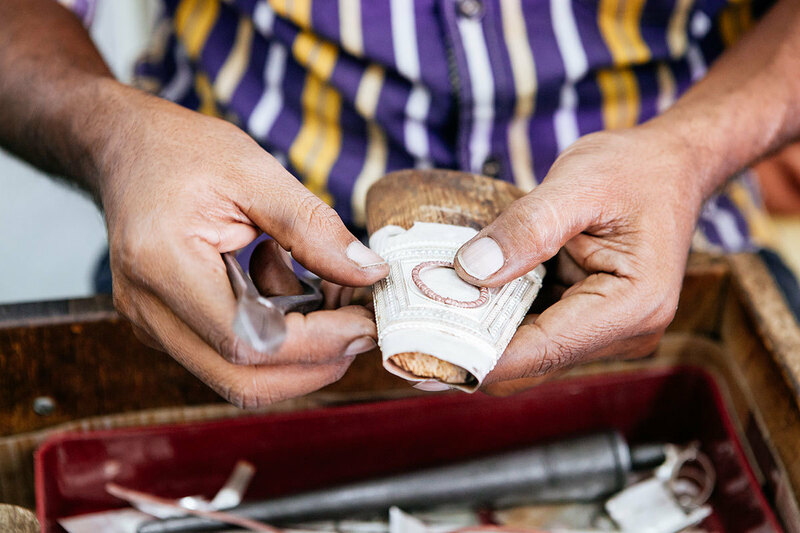 Craftspeople can tell from looking at a janbiya how old it is and where it was made. Daggers from Najran have sharply curved blades; those from the nearby Fayfa Mountains are longer, less curved. Elsewhere in Saudi Arabia, swords are important national symbols, and used in the traditional Bedouin dance Al Ardha. 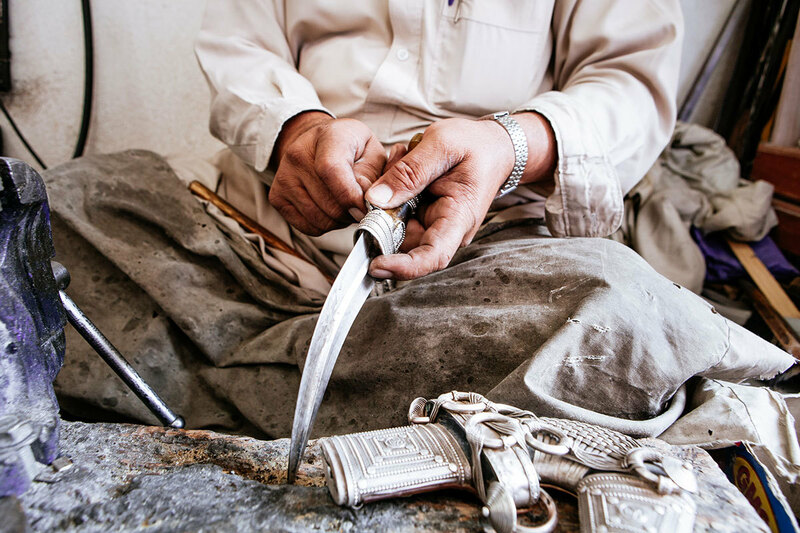 Janbiya owners in Najran often wear a small and sharp knife as well – they keep it in a separate handle attached to the back of the janbiya, to take out in case they need to cut anything. ‘The janbiya is a source of pride for us; we don’t use it to cut things. And we always keep it sharp and shining,’ says Al Munasteer. 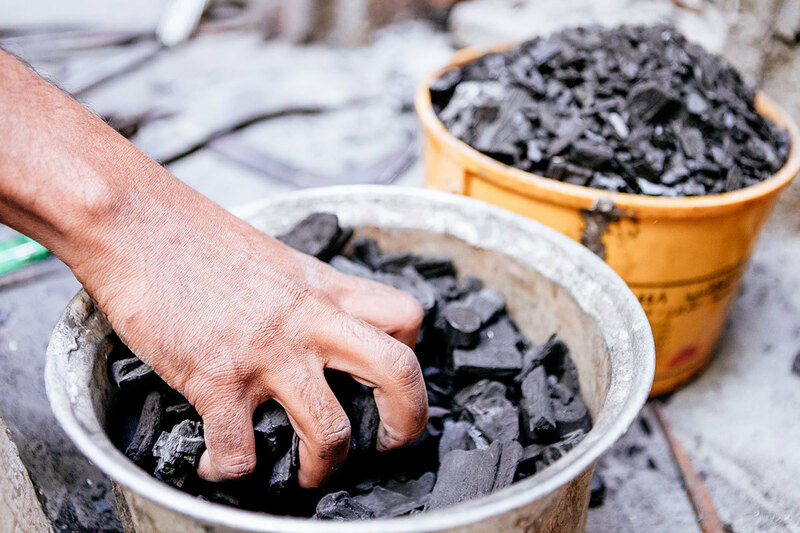 In his workshop, Qitayan throws more coal into the fire. He repeatedly sticks the piece of iron back into the flames, to prevent it from cooling down and becoming unable to form. A customer steps in, carrying a piece of iron. People often bring their own raw material to the dagger makers. Qitayan takes it, inspects the iron and beats it lightly with a hammer. No, he says to the man – it’s of bad quality and will not make a good janbiya. The customer walks away. Qitayan looks down again, and returns to forcefully shaping the heated blade. Many beats from now, attached to a carefully crafted hilt, it will become a fine Najrani janbiya. Read more about Al Ardha, the Warriors Dance in Riyadh.